Starting at the Cathedral Picnic Area, a relatively short and medium grade track (2 km, 45 minutes return) leads past the spectacular Cathedral and on to the Hump summit for fine views of Cresta Valley and the Horn. This shot of The Cathedral Rock and was taken at the 'saddle' between the Cathedral and the Hump. 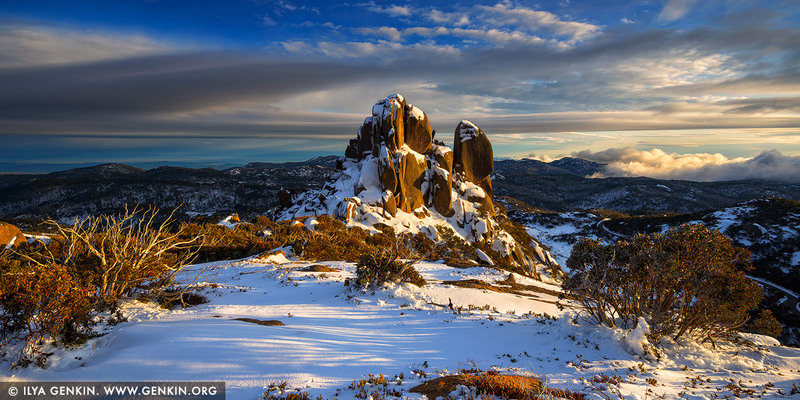 The Cathedral Rock is especially beautiful in winter on sunrise or sunset. This image id AU-MOUNT-BUFFALO-0001 of The Cathedral at Sunrise, is copyrighted © by Ilya Genkin. This is not a public domain image.